sedation dentistry costs depends on the complexity of the case, the cost of laboratory work and materials, the length of the sedation visits and other factors such as the patients medical history. Often with larger more complex cases the IV Sedation Dentistry costs may be included. Generally sedation dentistry costs for full IV sedation dentistry are $700-$900 for the first hour and $200-$250 per 15 minute increment thereafter. Oral sedation dentistry is around $500. Dental gas sedation is $150 for the first hour. Sedation dentistry is dentistry done while a patient is comfortably sedated and in a position to tolerate the treatment with stress or distress. Our sedative dentist (Dr. Gary Adams) provide whatever level of dental sedation necessary to keep you calm and comfortable during your dental appointment. For some high-anxiety dental patients, they may need as much as Full Sedation for dental cleanings and x-rays, while others may just need Dental laughing gas twilight sedation. There are various forms of sedation and sleep dentistry options. From oral sedation to full IV sedation dentistry we offer both options to provide a quick and painless appointment. We also offer dental laughing gas as a twilight for of sedation. Is Sedation Dentistry and Sleep Dentistry covered by dental insurance? If you have sedation dentist coverage and the procedures are covered by your dental insurance plan. The best way to find out is to come in for a no cost consult so we can check your insurance coverage and determine what treatment is necessary. When we get your insurance break down, our sedation consultants can determine your insurance coverages and explain them to you. Sedation dentistry is a safe and some cases more safe than dentistry performed without sedation. Our standard practice is that each patient will have their medical history reviewed and we’ll explain treatment options best suited for each case. Can I drive after being sedated? No. You will need to have someone drive you to and from your Sleep Dentistry appointment. You shouldn’t operate a vehicle for 24 hours after sedation. Oral Sedation Dentistry is sedation using a medication by mouth where a medication such as valium is swallowed to achieve a sedative effect. It typically takes 45minutes to an hour to take effect and additional doses may be necessary depending on the tolerance of the patient. What is Nitrous Oxide or Laughing Gas Sedation? Nitrous Oxide or laughing gas sedation is the use of a combination of nitrous oxide and oxygen gas for sedation purposes. Nitrous oxide can be used in combination or another sedative such as valium or it may also be used prior to IV sedation dentistry to calm the patient prior to full intravenous sedation. Can You eat or drink before sleep dentistry appointment? You cannot eat or drink for 12 hours prior to IV full sedation dentistry or oral sedation dentistry. You can eat and drink before nitrous oxide or laughing gas sedation. Is Sedation Dentistry Safe: Oral Sedation or Intravenous Sedation Dentistry? Oral Sedation Dentistry takes longer, is less predictable and cannot be reversed easily with sedative reversal drugs. IV Sedation Dentistry is fast, the level of sedation can be easily adjusted, it is very predictable and in most cases can be easily be reversed (since there is an IV in place). Generally, IV sedation dentistry is the best sedation method for patients with higher levels of anxiety. 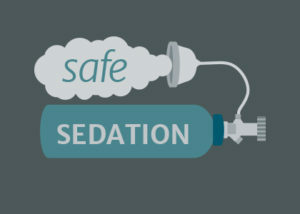 We believe IV sedation is safer and more predictable than oral sedation. While oral sedation takes longer and is less predictable, IV sedation is more expensive because of the level of training necessary for the dental anesthesiologist and the costs of the equipment necessary to deliver IV sedative drugs. Nitrous Oxide or Laughing Gas Sedation Benefits? Nitrous oxide or laughing gas sedation sets in very quickly, is very effective for mild to moderate anxiety, is very non-toxic and it wears off very quickly with little to no hang-over effect. A patient could have sedation and 30 minutes later drive a car. Will I remember anything after full sedation dentist appointment? What about after twilight? Most people do not remember a thing after full sedation dentistry. The report it was great and they not remember a thing. Twilight sedation patients will remember their procedure but they remember being more relaxed and less anxious than usual. Twilight is for less anxious patients where less is being done, like maybe one tooth is being removed. Does sedation dentistry hurt? Will I feel pain after dentist puts me to sleep? No, except maybe when we put the IV in but that does not hurt too much and we can give you an oral sedative is you are anxious about the IV. Once you are IV sedated, we will still use local anesthesia to numb your teeth, but you just will not remember it. The local anesthesia is necessary because the IV sedative drugs do not numb your teeth but just sedates you so you are not scared.